Golden paintbrush (Castilleja levisecta) is gaining ground in its native Oregon for the first time in more than 80 years. Recent reintroductions have seen the charismatic species flourish on its historic prairie landscape. To keep the momentum going, scientists are pulling out all the stops to ensure that the new populations are robust enough to endure. 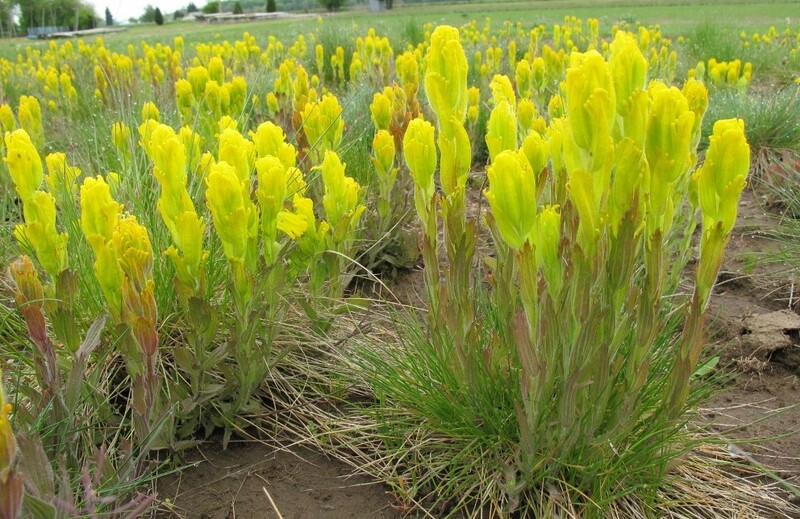 “Genetic variability will be key to the reintroduction success of golden paintbrush,” explained Adrienne Basey, graduate student in the plant biology and conservation program of the Chicago Botanic Garden and Northwestern University. Basey, who previously managed a native plant nursery, is now studying the genetic diversity of golden paintbrush plants before, during, and after they are grown in a nursery prior to reintroduction to the wild. “My work is looking at the DNA, or genetics, of the wild, nursery, and reintroduction populations to see if there is any change through that process,” she said. If there is a change, she will develop recommendations for adjusting the selection and growing process to better preserve diversity. “My goal is to give both researchers and practitioners more information to work with,” she noted. The research is unique in the relatively young field of restoration science, according to Basey’s co-advisor and molecular ecologist at the Garden, Jeremie Fant, Ph.D. “Adrienne’s study is awesome because of the fact that it has data and the samples to back it up; it is early on in this game of reintroductions and restorations, and potentially could have a lot of impact, not just for that species but what we tell nurseries in the future,” he said. 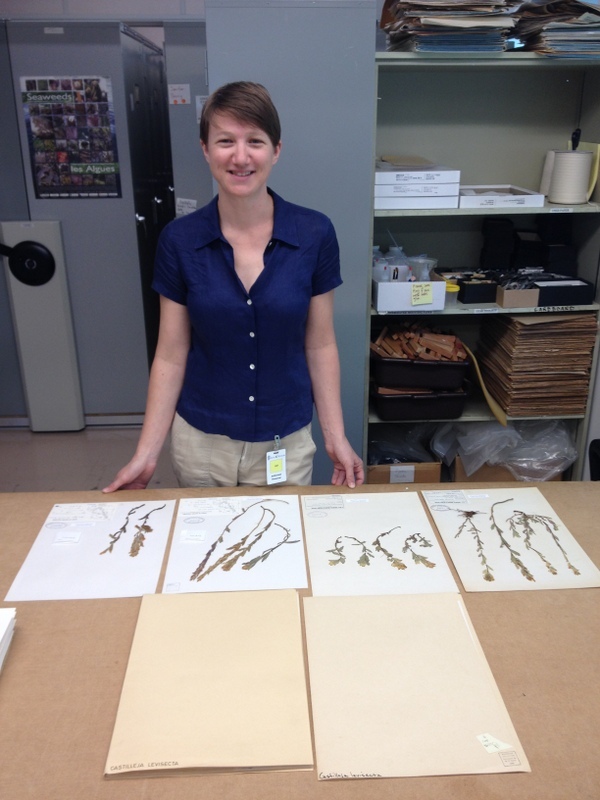 Basey is working with data collected over the past decade by research scientists at the Institute for Applied Ecology in Corvallis, Oregon, and University of Washington herbarium specimens from Washington and Oregon dating as far back as the 1890s, and data she has collected from existing plants during field work. “It’s a perfect partnership,” said Dr. Fant, who noted that the Garden is guiding the molecular aspect of the study while colleagues in Washington and Oregon are providing a large portion of the data and samples. The study itself will likely serve as a research model for other species in the future. “There isn’t much research out there to help propagators understand when and where genetic diversity may be lost during the production process,” said Basey’s co-advisor and conservation scientist at the Garden, Andrea Kramer, Ph.D.
Last year, Basey, Fant, and Kramer worked together to write a paper outlining ten rules to maximize and maintain genetic diversity in nursery settings. “My goal is to support reintroduction efforts by informing nursery practices and demonstrate to nurseries on a broader scale how their practices can influence genetic diversity through a single case study,” said Basey. Her preliminary research is focused on four golden paintbrush populations. Early evaluations show clear distinctions between a few of them, which is good news. Basey will next compare those genetic patterns to those of plants in reintroduction sites. According to Fant, earlier studies by other researchers have shown that many restoration efforts for threatened species suffer from low levels of genetic diversity prior to reintroduction, due to a number of causes ranging from a small population size at the outset to issues in propagation. It is critical to work around those issues, he explained, as the more genetic diversity maintained in a population, the better equipped it is to survive environmental changes from drought to temperature shifts. Basey will also compare the current level of diversity of golden paintbrush to that of its historic populations, to get a better sense of what the base level should be for reintroduction success. She plans to wrap up her lab work well before her summer 2015 graduation date. 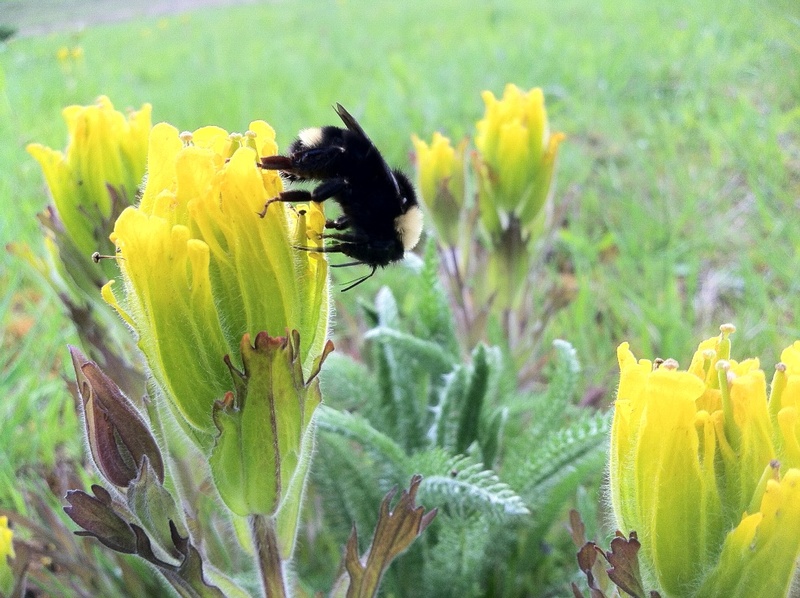 A golden paintbrush is visited by its primary pollinator, a bumblebee. For Basey, it’s about building a bridge between the theoretical and the applied aspects of restoration. “My interest isn’t so much in this single species but more in the communication of science to practitioners. I like to bridge the line between research and the people who are using research,” she said. Basey, like the golden paintbrush, is looking toward a bright future.